Growing up I remember hearing stories of "I was here, doing this and that, with so and so, when Kennedy was shot". And everytime I heard one of those stories, I never thought someday I have one of those moments of my own, that would forever bind me in that same thought process, until that very day on 9/11/2001 at 8:46am. I was sitting at the home office of Bass Footwear - then headquartered in South Portland, Maine. I was newly married and my husband was working in downtown Portland. I was sitting at my desk doing work as an Assistant Buyer in the Men's footwear department, listening to the radio when I heard those awful beeps that indicate an emergency, along with the words "We interrupt this program to bring you this breaking news". My sister and I are twins. When we were little we'd pass by the New York City skyline on one bridge or another and say - "look - there we are". I was the taller building (the North Tower) - the one with the massive antenna and my sister was the other "South Tower" standing beside "me". That was us. Standing tall in NYC - one of the places we always saw ourselves living when we got older, "were grown up" and moved out of our mom's house. As I listened on the radio that one of the twin towers was down, my heart sank. It didn't seem real and I began hearing others talking about the news and turning their radios on. I couldn't move. I stayed there silent listening to the panic and fear in the announcers voice. I tried to call my husband and finally got through after a few tries and found out his building was in lock down because of a person on the loose in downtown Portland considered to be armed and dangerous. My heart sank further. I continued to listen and then heard on the radio that the other Twin tower was hit and later that the Pentagon was hit too. I thought of my mom in on Long Island at school and wondered if she was ok. I thought of all the people I went to High School with, and College with and wondered and hoped that they were ok. I thought of all the people in NYC, anyone still in the air and prayed for them all. The praying has not ceased. 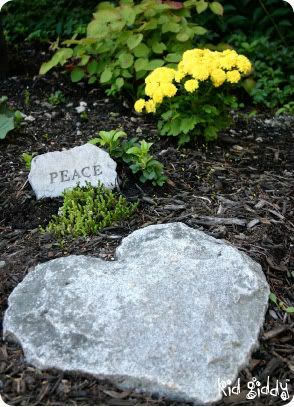 We later found out that one of the hijackers flew out of our very own, nearby, Portland Jetport only minutes and miles away, into Logan airport sending waves of shock and fear at the thought of every flying again, or even seeing my husband, or my family and friends. Although time has passed, all these years have been permanently altered from this one day. Lives have been forever changed and continue to change by those cruel acts of senselessness. 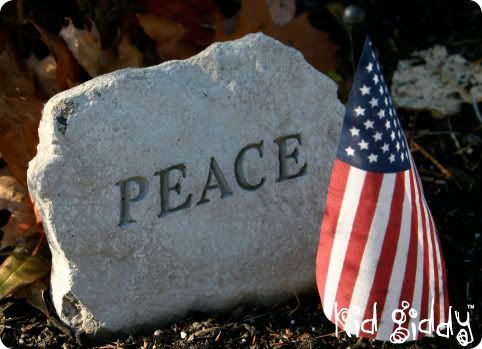 For all of you out there directly or indirectly effected by 9/11 - I am still praying for you. May you always have peace and hope in the marvelous light of Christ and know that you will see your loved ones in the life to come when we depart this earth. Until then, I will never forget and I will continue to pray. God Bless! Please watch this video titled "Finding Hope". I love having a reason to make really cute stuff for my friends. I went to my friends Bridal shower in the beginning of August and whipped up these pretty little pouches and sachets for her honeymoon & general travels, a couple of days before arriving at her house. I tried using her wedding colors - but found out (after she opened them) that she changed her colors ever so slightly! Sort of bummed - but they were still cute in my book and hopefully she's not holding it against me that I wasn't on the up and up with her new colors! 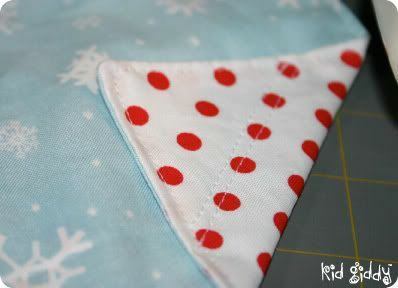 As I made them, I took some photos to share these basic pouches with all of you (my readers)! 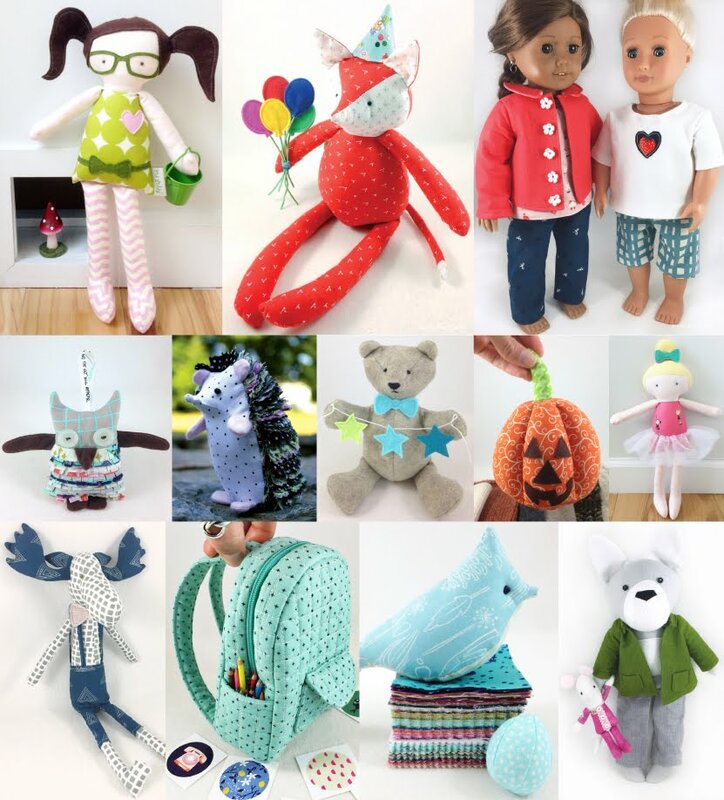 You can make these too - the are so easy and great for beginners! So let's get started! 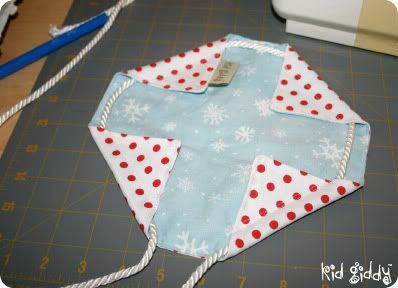 Lay squares right sides together, sew 2 inches of one side and then all the way around leaving only 3-4 inches open. 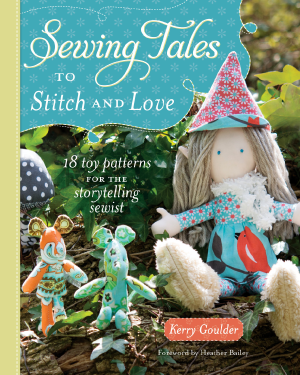 Turn right side out, press if necessary and top stitch all the way around the edge. 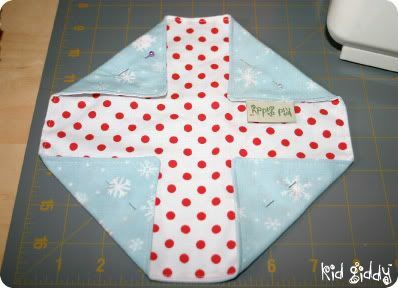 Fold up your corner using your angle marks on your cutting board as shown above (corner to corner on a 3 inch square). 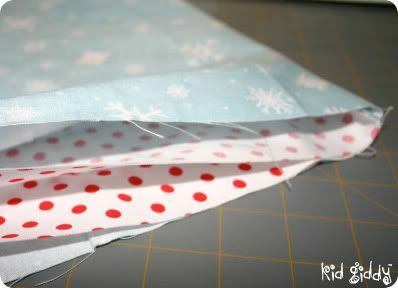 Use a decorative stitch (I just did a double line since I don't have fun stitches) to tack the corner down about 1/2" - 3/4" away from the fold. 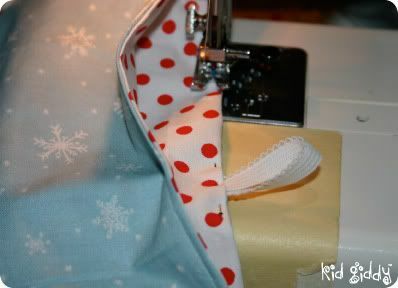 After you stitch your corners down, thread your ribbon or rope through the holes. 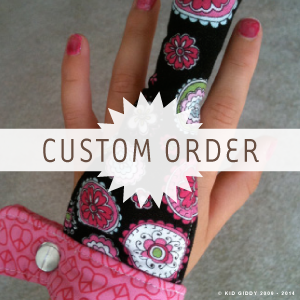 Use a turning tube to make it easier. 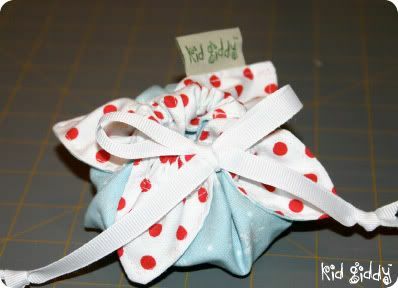 Flip this over (shown not flipped) and pull the ribbon/rope to cinch your pouch, push the center down as you go. Tie it into a bow. 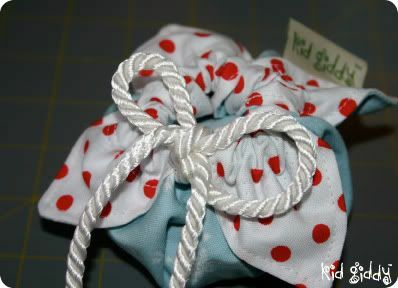 I did this rope first (hence the photos)...but for the size of this pouch, I liked the look and ease of the ribbon better! It also made the hole much smaller in the center. For a much larger pouch, I think the decorative rope would be perfect. 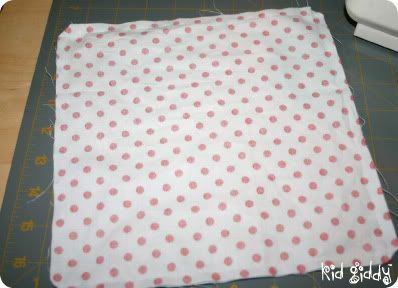 Place your fabric right sides together. 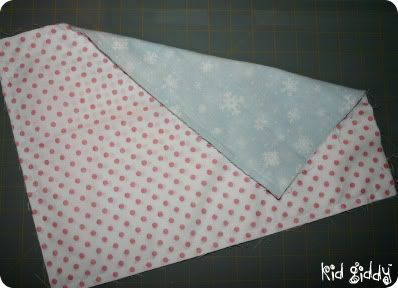 (Polka Dot to Polka Dot and separately Snowflake to Snowflake). 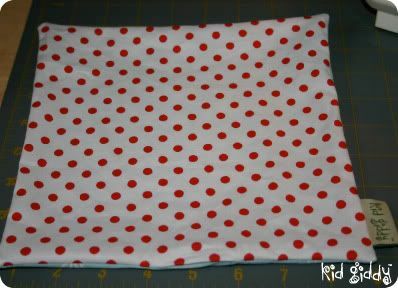 Working only the Polka Dot fabric for now, stitch the top 1 - 1/2 inch on both corners of your long sides. 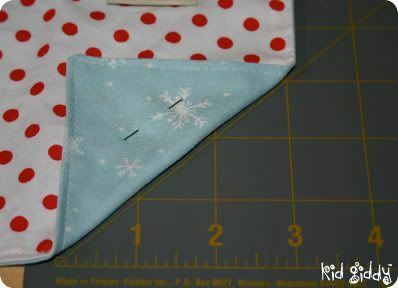 Then do the same with the Snowflake fabric. Now put both pairs on top of each other and mark 1 inch with a pin. DO NOT sew this one inch, but sewing the entire length of the pouch across the bottom and up the other side (again not sewing the remaining 1 inch!). 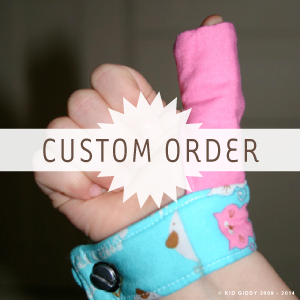 Decide which fabric you want out and then turn your pouch right side out. 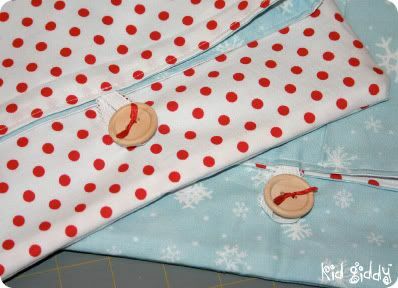 The top side seams won't be connected, but the length and bottom of your pouch will be. 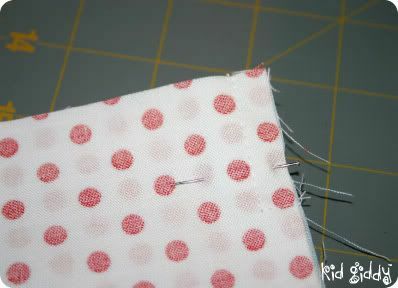 Fold the top edge down to the inside 1/2 inch starting at the seam, and then fold the lining down to the inside as well. Line up the seams and pin in place. 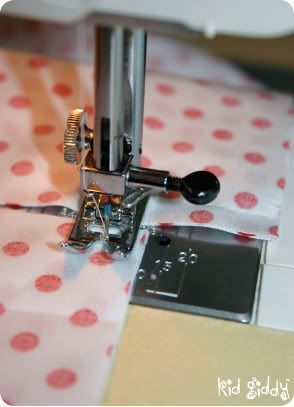 Do this on the other side seam, and then in each center point and then all the way around the top of your pouch. 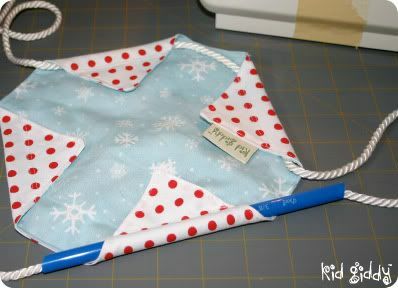 Once you have pinned all the way around, mark your center point on one side of the top of the pouch. This is where you'll place the elastic. 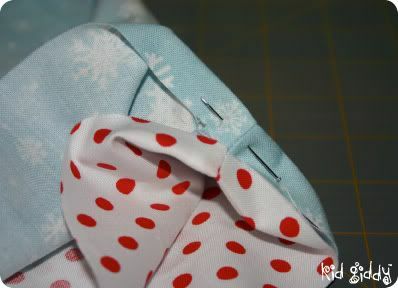 Pin that in place and then top stitch all the way around your top edge. Be sure to double over the elastic for added strength and security. 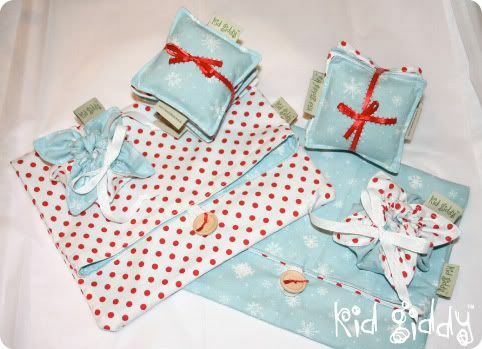 Finally, place your button in your desired position on the front of the pouch (with the elastic on the back top edge) and thread your embroidery floss carefully through the top layer of the fabric and the button. 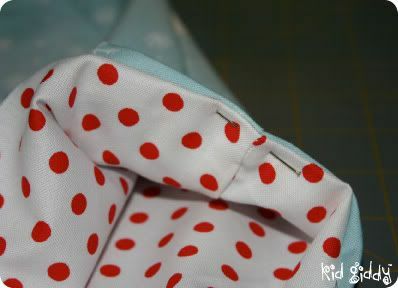 Tie a knot on the top of the button and then loop the elastic over the button. No one wants to have all of their bras and undergarments falling out all over the airport, and everyone loves to have some cute pouches to put their precious belongings in...so make one today...or two! Go nuts! Thanks for stopping by and thanks for sharing my blog! I hope you enjoyed these tutorials. If you did and you'd like to see more like this - please leave me a comment and let me know! Please do not copy my tutorials, but feel free to post a link to share with your friends and family! Have a great day! 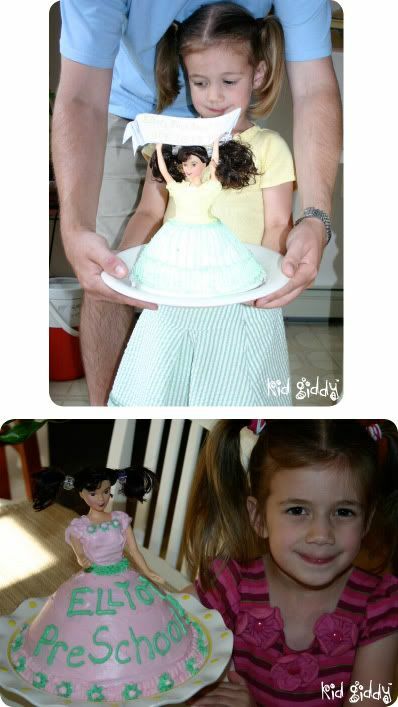 Edible Wednesday: Back to School Cakes - A Time to Celebrate! When my daughter was old enough to go to PS I had my reservations letting her go, but knew I chose a great place to give her new experiences and find new friendships. But the letting go was horribly sad for both of us. 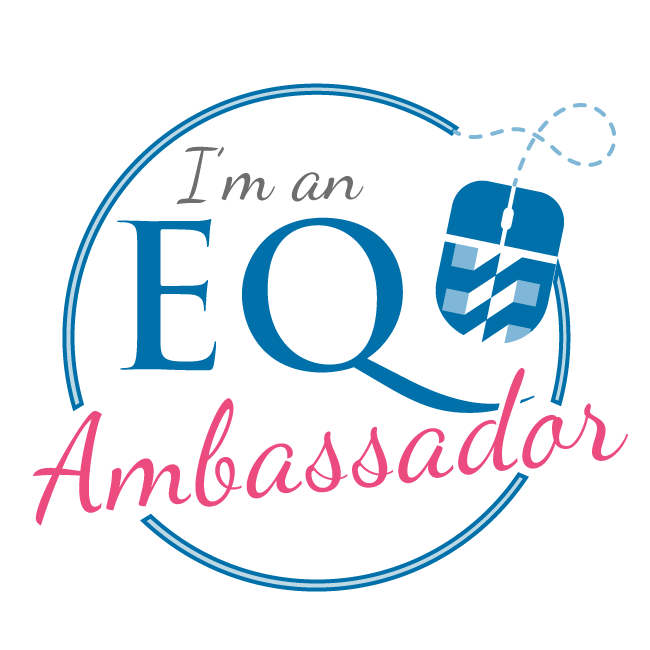 That was the one emotion of myself that I was not expecting at that time - I was ready for a little breathing room (or naps)! To get us both through that approaching first day, I realized I had to plan something fun, and give her something to look forward to! It proved to be my smartest mommy moment to date! I made her a cake and said we were having a "First Day of School Party!" She left the house with excitement and as I left her I reminded her to be excited for her awesome first day party and her awesome Pre-School cake! We haven't gone as crazy since (the "party") but, we all still enjoy celebrating the first day of a new school year with some yummy cake! 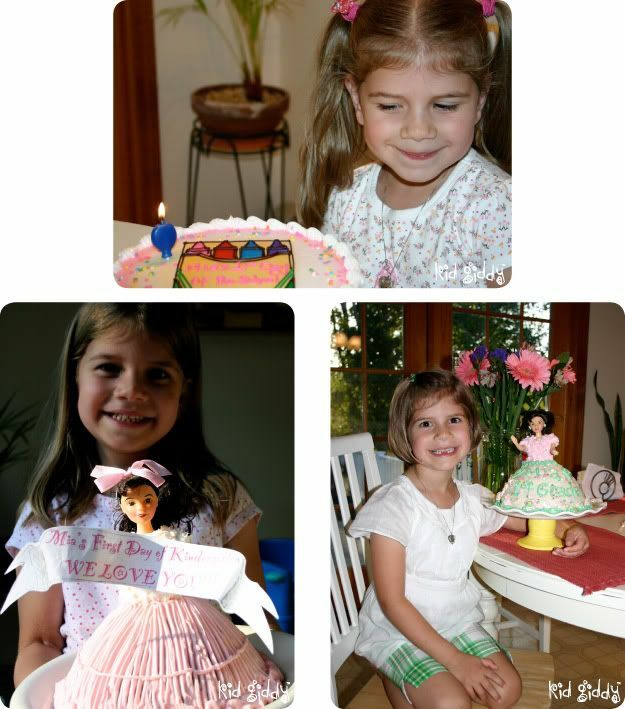 Thinking of the milestones brings tears to my eyes and a lump in my throat - so while I go grab some tissues check out some of our cakes, purchased or otherwise attempted to make....(the one craft I can't do is cake decorating!) lol! It's never to late to start your own tradition! 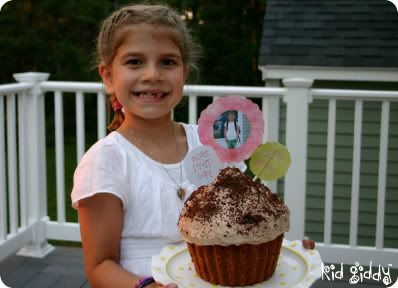 Celebrate your child's first day of school with a yummy cake too and let me know how it goes! Have a yummy day!